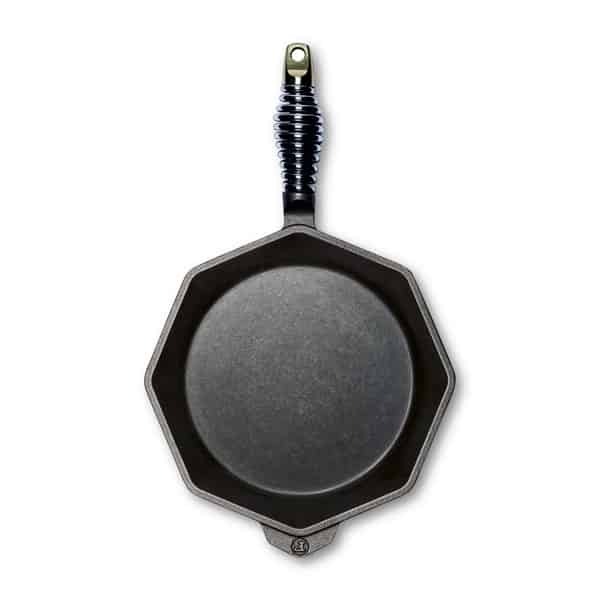 Cast Iron Skillet Roll Recipe | FINEX Cast Iron Cookware Co. 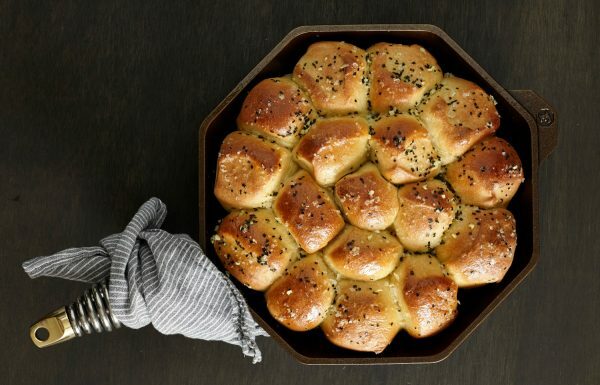 These skillet rolls make a delightful (and surprisingly easy) addition to any dinner table. Cooked & served in our 12″ skillet they look lovely and taste even better. Mix​​ ​​yeast​​ ​and​​ 1 Tbsp ​​sugar​​ ​in warm​ ​water, stirring until sugar dissolves. Warm​​ ​the milk​ over low heat, stir in​ remaining ​​sugar​,​ ​​salt​ and ​​butter​​ ​until salt and sugar are mostly dissolved and mixture is ​lukewarm. ​Combine​ ​the​ ​yeast​ & egg ​mixture,​ ​the​ ​milk mixture,​ ​and​ ​all​ ​of​ ​the​ ​flour.​ Stir​ ​to​ ​combine​ ​well, cover and let rest (15 mins). Using​ ​a​ ​stand​ ​mixer​ ​with​ ​a​ ​dough​ ​hook,​ ​knead​ ​the dough​ ​for​ ​5​ ​minutes. On​ ​a​ ​floured​ ​surface,​ ​roll​ ​out​ ​the​ ​dough​ ​and​ ​and divide​ ​it​ equally ​into​ 15-​18​ ​balls, between golf ball and tennis ball in size. Cover​ ​and​ ​let rise​ ​for​ ​25​-30 ​minutes at room temperature. 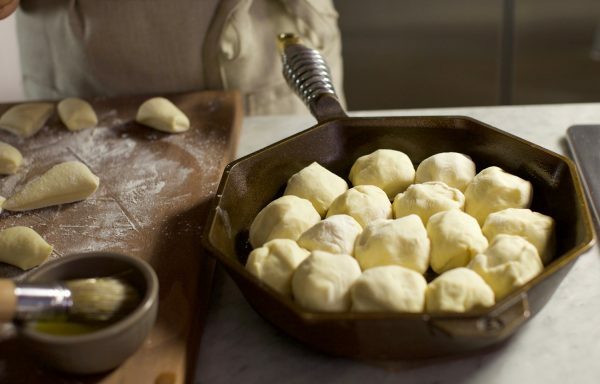 ​Apply​​ ​baking​ ​spray​ evenly to a FINEX 12″ ​Cast Iron​ ​Skillet then arrange​ ​the​ ​dough​ ​balls in the skillet, gently resting against each other and the edges of the skillet. Sprinkle the rolls with Jacobsen Flake Finishing Salt. Bake for 18-25 minutes, or until the surface of the rolls turns golden brown. Brush with melted butter and serve warm. Enjoy!